The teen who's credited with leading hundreds of bicyclists on a ride along I-676 near Eighth Street in Philadelphia, that blocked traffic over the weekend, has been charged by Pennsylvania State Police. A male juvenile who police identified as being "responsible for organizing the event" was taken into custody around 9 a.m. Thursday. He faces misdemeanor and summary disorderly conduct charges, according to state police. Police have not released the teen's name. Corey Murray, 16, earlier took responsibility for the stunt during two interviews on FOX29, telling reporters that the ride along the Vine Street Expressway was part of a birthday celebration. 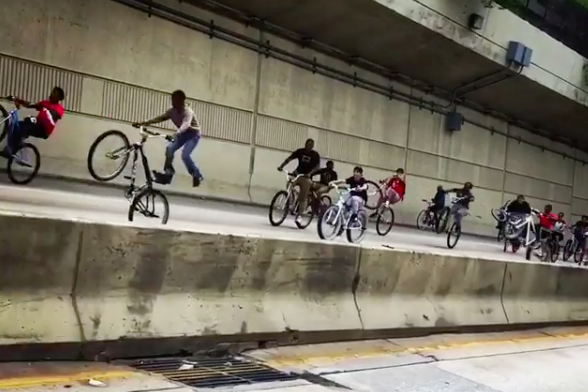 Videos posted on social media show hundreds of young people riding bikes down the Vine Street Expressway over the weekend. Police said the ride happened on Sunday at 2 p.m.
Murray appeared live on FOX29's "Good Day Philadelphia" where co-host Mike Jerrick was both applauded and criticized for chiding the young teen about incident. Jerrick said Murray is trying to be "a rebel" and the South Philly teen was more "Pee Wee Herman than a Hell's Angel." No other charges have been filed at this time.